A mysterious sinking, a group of dedicated scientists and technicians and a 200 year old shipwreck have all collided in the Gulf of Mexico. Four thousand feet below the choppy seas the remains of a 19th century shipwreck lie in wait and a month long expedition has been mounted to uncover her secrets. 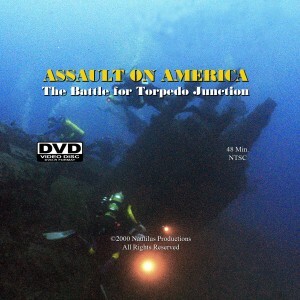 This is the deepest underwater archaeological project ever attempted and Nautilus Productions spent 18 months working with archaeologists, conservators and scientists from Texas A&M and the Minerals Management Service (now BOEM) to create a one hour, high definition, educational documentary about the project. The Mardi Gras Shipwreck site is located just off the Louisiana coast in the Gulf of Mexico in nearly 4000 feet of sea water. The team used a state of the art remotely operated vehicle (ROV) to survey the wreck and recover artifacts from the site. Information indicates the shipwreck may date between 1810 and 1820 time period and could possibly be a War of 1812 gun runner or British trader. After recovery Texas A&M’s Center for Marine Conservation conserved the historical treasures removed from the bottom of the Gulf of Mexico. The artifacts are now on public display at the Louisiana State Museum. 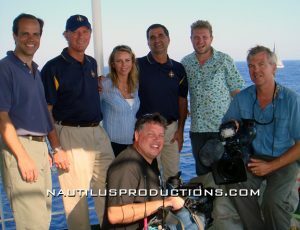 In 2009 the Nautilus crew was hired by CBS 60 Minutes to assist in production of “Bob Ballard, The Great Explorer” in the Aegean Sea. The deep sea between Turkey and Greece is a graveyard for ancient shipwrecks. Many still lie undiscovered at the bottom of the ocean, fragments of history that remain beyond reach thousands of years later. One of the greatest undersea explorers in the world, Robert Ballard, is trying to uncover their secrets. When Ballard took “60 Minutes” and correspondent Lara Logan with him to hunt for ancient shipwrecks off the coast of Turkey, we made an extraordinary find even he didn’t expect. To get to Ballard, we had to make a journey of our own to what used to be one of the great crossroads of civilization. For thousands of years, ancient mariners passed through beautiful but treacherous waters to the place where the Aegean Sea meets the Mediterranean. Many of them didn’t make it, their ships sinking deep below, as far as 2,000 feet down, never to be seen again. That’s where we found Ballard. You may know him as the man who discovered the Titanic, but what he couldn’t say then is that he was on a clandestine mission for the Navy at the time. It was a secret he kept for more than two decades until the mission was declassified. You’ll hear how that mission helped him find the most famous wreck in modern history and about Ballard’s many other discoveries in his 50 years at sea. Nautilus Productions provided our particular video expertise in marine environments. 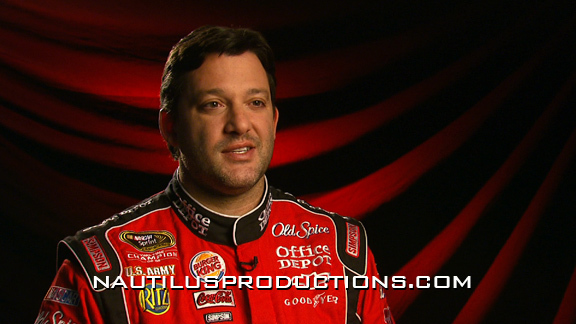 From 2005- 2012 the Nautilus Productions crew worked with the great folks at Office Depot covering their sponsorship of NASCAR, Sprint Cup racing. Our work included shooting press conferences, races, special events, documenting special paint schemes (car wraps) and in store training and promotions. We had the great pleasure of working with Carl Edwards and the always entertaining Tony Stewart (our favorite). 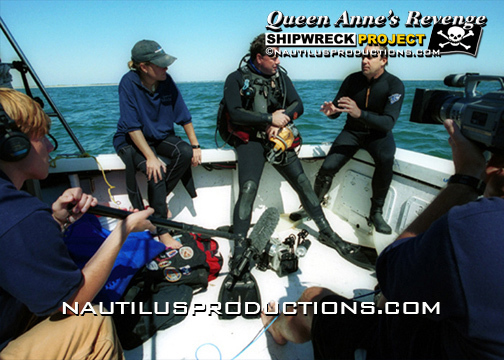 In February of 2006 Nautilus Productions documented the capture of Sand Tiger sharks for science. 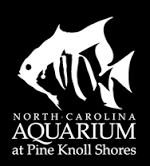 Working under permit the experts at the North Carolina Aquarium at Pine Knoll Shores captured several juvenile Sand Tiger sharks (Carcharias taurus) for public exhibition at their facility. No Sand Tigers were harmed during the filming. In September of 2005 Rick Allen (2nd camera & underwater camera) and Ric Hase (sound) provided their maritime video expertise for the Mega Movers series on the History Channel. 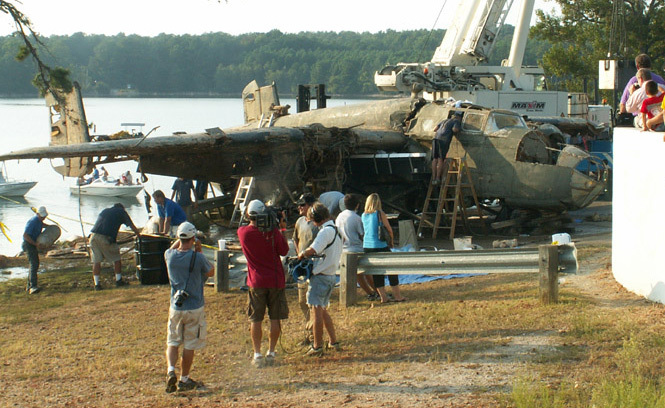 In 1943 a B-25C Mitchell bomber crashed during a training exercise and sunk into the cold and murky waters 150 feet (46m) below the surface of Lake Murray, SC. The aircraft lost it’s right engine on impact but the crew escaped unharmed. The aircraft became a dive site for local technical divers until she was raised from the depths of the lake in the fall of 2005. Dr. Bob Seigler who spearheaded the project, John Hodge and Dr. Bill Vartorella, formed the Lake Murray B-25 Rescue Project to salvage her from the bottom of Lake Murray. After recovery, which took 3 weeks, the remains of the aircraft were moved to the Southern Museum of Flight in Birmingham, Alabama for conservation and museum display. “The Kill Zone” is a one hour doc that explores the unique hunting skills of the Great White Sharks of False Bay, South Africa. No where else on Earth can you witness 16 foot Great White sharks catapulting into the air while stalking and killing their prey. Take a personal look at the German U-boat war on the East Coast. Visit with the witnesses and victims of the carnage and German submariners as they share their experiences of World War II. Find out why the East Coast was called “torpedo alley” and visit the bones of the U352 as she lies in 120′ of water 26 miles off the North Carolina coast. “Assault on America” gives both a personal and historical perspective to one of America’s closest brushes with World War II. Following the United States’ entrance into the war after the bombing of Pearl Harbor, the German Navy launched submarines to attack and destroy the wartime shipping operation off the East Coast. The Germans anticipated the U.S. lack of preparedness for their assault and capitalized using just a handful of U-boats to sink more Allied tonnage off the East Coast, than the entire Japanese Navy could claim in the Pacific. This is a story of devastation, fear and survival. And remarkably, this is a story still relatively unknown to many. The frightening and amazing details of this story are told by those who lived it. The seamen who survived the U-boat sinking of their merchant ship relate the chaos of escaping a burning ship. A German U-boat radio operator tells of the life and death existence aboard his ship and his crew’s experience upon being attacked and sunk by the U.S.Coast Guard. People who were children at the time of these assaults recall seeing the ocean on fire, the prescribed blackouts coastal residents ignored, and the debris that washed ashore following the attacks. The viewer will visit the remains of some of these ships as they sit on the bottom of the ocean and journey back in time to a pivotal point in World War II. Aired on the Canadian History Channel in 2001. The Nautilus Productions crew spent two years producing stories for the National Geographic Channel’s news magazine – National Geographic Today. The Nautilus crew covered the recovery of the turret of the USS Monitor, tagged sharks with the Shark Research Institute, dove on the Aquarius habitat and examined Grouper populations in the Florida Keys, documented invasive Lionfish populations in the Atlantic with NOAA and much more. 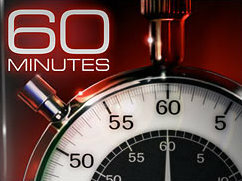 The half hour web series, produced during the early 2000’s, featured the work of underwater filmmakers from around the world. Each segment features some underwater theme and focuses on shipwrecks, history, biology, marine life or undersea research. We have covered topics as diverse as Great White sharks in South Africa, the Aquarius underwater habitat in the Florida Keys, US Army Special Forces divers, manatees, German Uboats, Fiji and much more. The DIVELOG series is targeted to adventurers, divers, snorkelers or anyone with an interest in travel and the majesty of the underwater world and can be viewed on the Nautilus Productions YouTube channel. 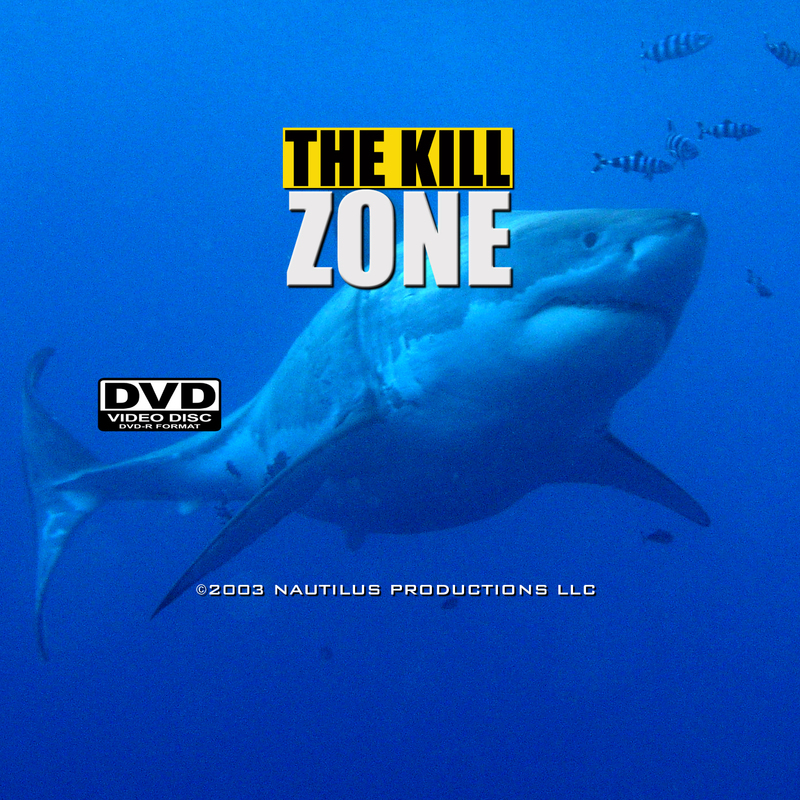 In June of 2001 the Nautilus Productions crew produced a the first ever shark hunt in North Carolina’s waters using bait, chum and a cage. Will they find a Great White or some other underwater denizen? 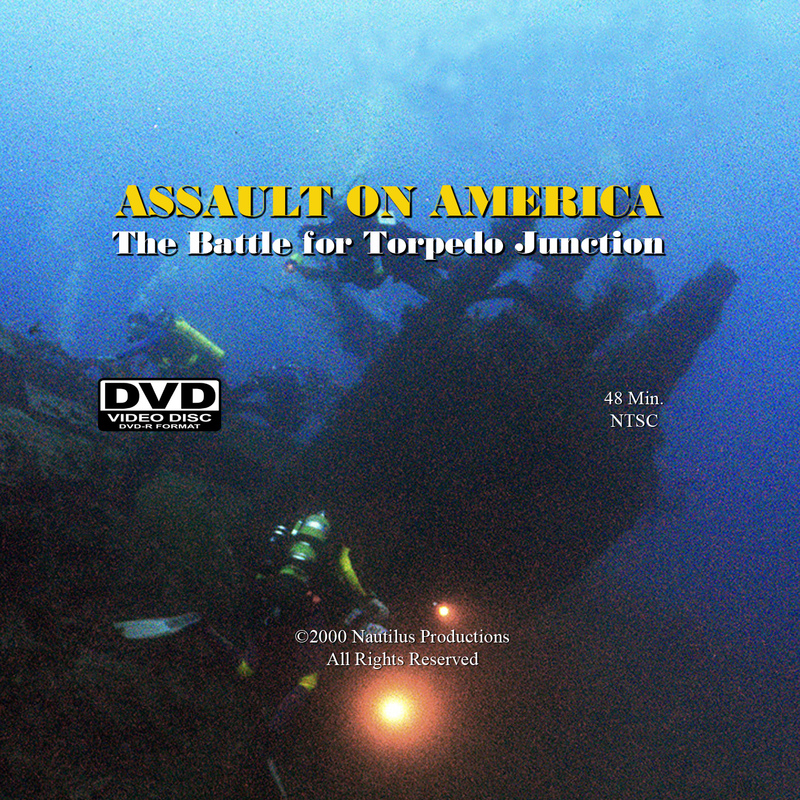 Also during June of 2001 the Nautilus crew took viewers back in time nearly 60 years to out why the East Coast was called torpedo alley. We visited the bones of the U352, a WWII German Uboat, and the casualties of German submarines in this historical and underwater video produced for Turner South. 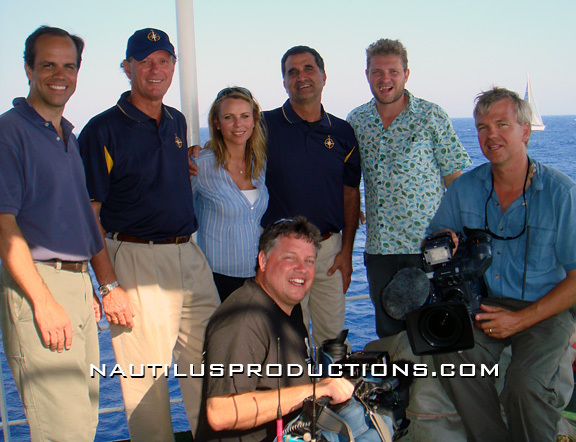 The Nautilus crew provided freelance videography and sound services from 2000-2002 for Liars & Legends and Off The Menu. Dive with the endangered and fearsome Sand Tiger shark and you’ll see why divers and adventurers travel from all over the globe to swim side-by-side with these graceful and magnificent creatures. Explore the sunken wreck of the Papoose (now identified as the Hutton), a tanker torpedoed during WWII by a German U-boat. 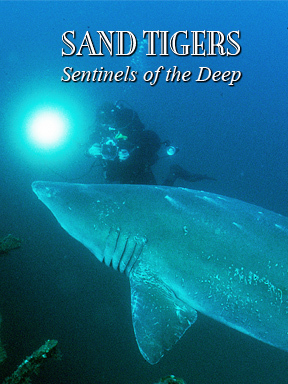 Here divers literally get nose to nose with dozens and sometimes even hundreds of Sand Tigers. This reality based documentary offers stunning underwater footage and the decidedly unique opportunity to experience the power and beauty of the Sand Tiger shark up close and personal. “Rodin: Portraits of a Lifetime” opened Feb. 11, 2016 at Methodist University’s David McCune International Art Gallery. Nautilus Productions proudly produced the display video and commercial that accompanies the exhibit.